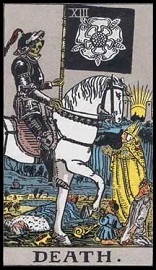 On this Tarot card we can see a skeleton bending over and holding a scythe in its hand. 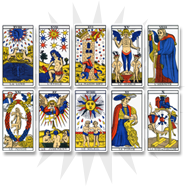 Symbol of death, those two elements give us some information about the signification of the card. The skeleton is leaning over and we notice other pieces of skeletons - hands, heads - at his feet. The ambiance of this card is extremely negative. 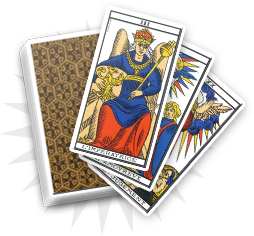 A radical change unexpected in your life, a refreshing element in your love life or the development of your projects is about to happen. This means the end of a complicated situation and the completion of something. This character also means innovation: new ideas will break the established order through the revelation of a reformist rebellion. Total failure, abandonment by several persons, or the end of some projects or some of your ambitions. 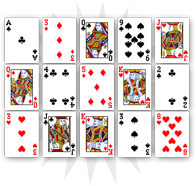 This card means the end of something and destruction, as well as cruelty through the presence of an executioner or isolation. The character is in full flight; he wanders in the obscurity and loses his self-confidence. You know how to question things and you have reached an important step in your life. It is the end of something, probably the final end to a difficult long period. You have found a goal, a limit, and an objective. A project arrives is coming to an end or is taking a new dimension. Turn the page; it is time to write the next one. You are denying the obvious and you refuse to accept that something has changed around you. It is the end of a situation, maybe the end of a romantic relationship or a professional relationship. It is difficult to admit the truth especially when it means the end of a happy moment. You have to think about a break-up. One of your projects has to end because you spend too much energy trying to achieve it. You have to end your relationship or reconsider your conditions. A transformation is necessary in your life in order to find a positive dynamic. In your professional life, you may need to change something and it could be well accepted by your entourage. 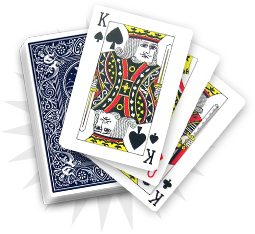 Reconsidering your projects, your relationships, your ideas or the way you are leading your life: this change should come up soon enough. It is necessary, as you have to move forward. A limit has been reached; you just have to get over it. It is a necessity to break-up from your current life. You have to learn how to end things in order to discover new elements. You will surely go through a big disruption but you will find the strength to survive it. Change has to occur now: you should not be scared of it.